Sacre bleu! 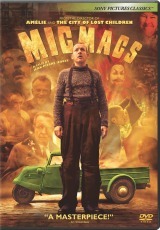 Micmacs by Jean-Pierre Jeunet (Amelie) is the busiest movie of the year. The actors stay in constant frenzied motion, the cameras breathlessly swirl around them and the frantic sound design zings around the room and comes at you from all directions. Too bad the narrative coherency places second to the visual and aural action, or Micmacs would easily rate a five-dish review. As it is, there’s just too much back-and-forth to keep up with in the film, and it’s quite a challenge to keep your eyes and ears on the plot. Dany Boon (Joyeux Noel) is Bazil, orphaned as a boy thanks to a land mine and living as a homeless, jobless vagabond with an errant bullet in his head that could kill him at any minute. Joining with his band of eccentric friends from the street, he embarks on an ambitious bit of civil disobedience to bring not one, but two multi-national arms manufacturers to their knees in a scheme that probably makes more sense in French than in English subtitles. His team is sort of an A-Team of nutjobs, including a contortionist (Julie Ferrier), a math whiz (Marie-Julie Baup), a wise Congo ex-pat (Omar Sy), a master thief (Jean-Pierre Marielle, The Da Vinci Code) and the bookish Buster (Dominique Pinon, Diva). Can they put the munitions companies out of business? Or will they be killed in the process? The answer might surprise you. Director Jeunet chose his cast for their slapstick skills and their rubbery faces. He seems to have poached his talent from a particularly zany production of Cirque du Soleil, as well as their costumes. Although the actors are working their talented French derrieres off, the leaky plot lets them down. Jeunet, who kept a frantic pace but wonderfully compelling string of action in Amelie, has been watching too many Terry Gilliam (Brazil) films and doesn’t put any heart behind the often-striking images in Micmacs. In the end, we’re left wondering what the hell was that all about, and what the heck is a “micmac” anyway? We might never know. Special features on the DVD include a commentary by the writer/director and his leading man and a group of “Absurd Death” animations that are as funny as their name implies.